Appetizers don’t get any easier and scrumptious than these hot, cheesy, messy Philly cheesesteak sliders. I think all sandwiches should be made on Hawaiian Sweet Rolls. They just makes everything so freakin delicious! What is it about a messy, cheesesteak that makes you want to devour it like a beast!? You take one big cheesy beefy mouthful while nodding your head in approval at the delicious flavors you are experiencing. Or is that just me? We couldn’t get enough of these philly cheesesteak sliders and the entire pan was gone by the end of dinner. (We rrrreally like food in this house) The steak strips are super seasoned with a homemade steak blend, along with the onions and peppers. I didn’t add any fresh garlic this time, but you certainly can. The hawaiian sweet rolls are buttered down and toasted in the oven and fresh provolone cheese just ties everything all together. But this recipe just isn’t complete without a good pepper sauce for dunking! OMG I purchased a bottle from Firehouse Sub (go get a bottle if you have one in your area) I have yet to taste anything better on a Philly Cheesesteak sandwich than Captin Sorensens Datil Pepper Hot Sauce! NOTHING!! Add a pickle and a good spreading of mayonnaise and I am one happy girl! 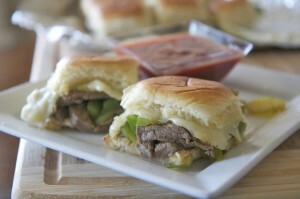 Watch me make these Philly Cheesesteak Sliders from start to finish! Mix together the steak seasoning. Sprinkle steak with steak seasoning, reserving about a teaspoon. Cover, refrigerate for at least an hour, overnight is great. Cook steak in a tablespoon of butter until done. Drain & set aside. In the same pan, sprinkle onions and peppers with remaining seasoning and cook until tender. Line a casserole dish with foil paper. Slice the entire pack of rolls in half. Lay the bottom half in the casserole dish and top with steak, onions and peppers. Bake for 10-12 minutes until rolls are golden and cheese is melted and bubbly. Serve hot with datil pepper sauce and a pickle. This recipe is a homerun every time! 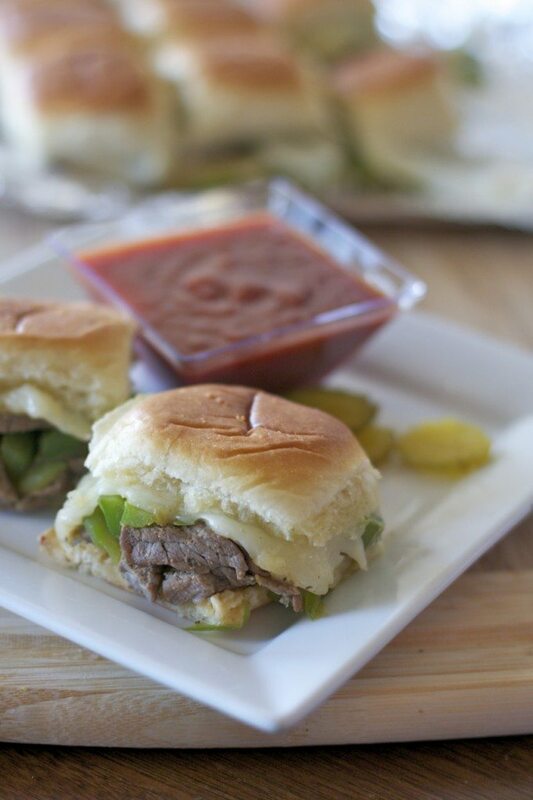 Your Philly Cheesesteak Sliders are amazing … and I was born and raised in Philadelphia!!!! Ohhhh myyyy GOODNESS!!! My family loved these! I had to thaw some more steak to make another pan. The seasonings are on point! Definitely added these to the menu when I meal plan for the week! Thank you so much for sharing this recipe! I made it tonight exactly how you instructed and they were sooooooo good!!! I was worried that my steak would be tough if I cook them cold but I took them out the refrigerator an hour before cooking. They were perfect! Thanks again!! Ooooh girl! You are changin up our menu. These cheese steak sliders are wheweee delicious and smell like you’re at the restaurant. I made them for dinner last and Told my daughter, “Uh Monique is the bomb!” She said “Mom you don’t even know her like that, she my best friend.” Just thought you should know we’re happy I found Divas Can Cook. Nice work!